South Miami becomes the first Florida city requiring solar on new homes. South Miami's new law will mean more rooftop solar and less reliance on fossil fuels. When it comes to watching the impact of sea level rise first-hand, low-lying Miami, Fla. is ground zero for the country. 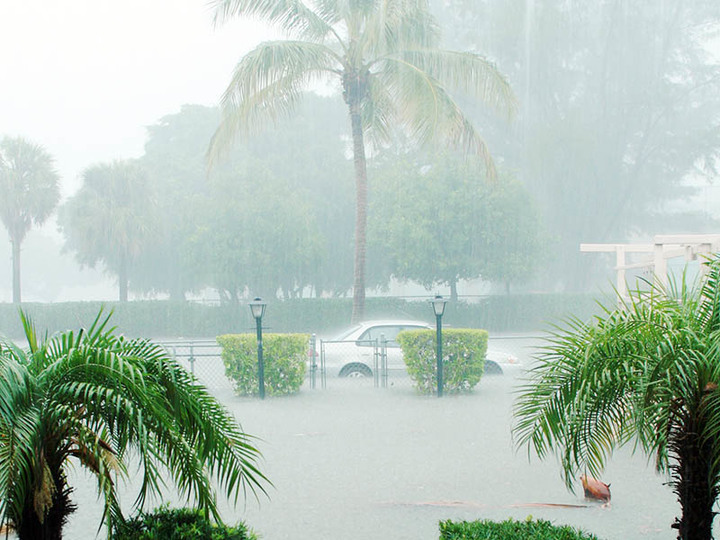 High tides swamp its streets, Miami Beach has had to modify its sewage and drainage systems, and an octopus recently grabbed headlines when it showed up in a flooded parking garage. The climate change reality that’s hitting Florida sparked a groundbreaking new law this summer: South Miami became the first Florida city to require that all new residential buildings install rooftop solar. It may be a tiny, 2.3-square mile municipality of about 11,000 people, but South Miami’s city commission vote for solar could be a game-changer. Heavy rains drench a home in South Miami. The impetus for the ordinance was Delaney Reynolds, a 16-year-old high school girl who warned South Florida leaders: “We're going to be the ones who inherit this mess, and we're going to be the ones to solve it as well." Reynolds founded a nonprofit called The Sink or Swim Project. She had read about a solar rooftop ordinance passed in San Francisco and wrote to several South Florida mayors urging them to follow suit. South Miami’s Mayor Philip Stoddard responded and invited the enthusiastic teen to help with the local ordinance. Florida’s nickname “The Sunshine State” hasn’t translated into solar energy love among the state’s politicians. Utilities have been holding fast to fossil fuels as their go-to energy source, and Earthjustice has had to log many hours at the state’s Public Service Commission to try to get state regulators to require more renewable energy and conservation measures. It hasn’t been easy in a state where our governor, Rick Scott, banned state employees from even using the words “climate change” or “global warming” in official communications, emails and reports. Delaney Reynolds delivers a TED Talk on climate change. Electric utilities in Florida have been aggressively trying to control the solar energy market. When news hit that South Miami was considering the ordinance, locals reported getting robocalls from a Washington, D.C. lobbying group tied to the National Association of Electrical Distributors. The tactics were familiar. We endured them last fall, when the state’s utilities backed a Florida Constitutional Amendment that was designed to sound pro-solar but would actually have made it harder for people to put in their own solar installations. Earthjustice attorneys went to the state Supreme Court on behalf of Progress Florida, Environment Florida, and the Environmental Confederation of Southwest Florida to argue that the measure would be confusing to voters, but the Supreme Court declined to take the measure off the ballot. Fortunately, voters saw through the charade and defeated it at the polls. South Miami is not exactly a huge growth market—the city gets less than a dozen applications for new homes a year. But it is leading the way on an issue none of us can afford to ignore. Under the new ordinance that takes effect in September, new homes will be required to have 175 square feet of solar panel per 1,000 square feet of sunlit roof area, or one panel with 2.75 kilowatt capacity per 1,000 square feet of living space, whichever is less. If a house is built under existing trees, the shade may exempt it. The ordinance doesn’t apply to commercial construction. South Miami Mayor Stoddard—a biology professor who lives in a solar-powered home and educates tirelessly on climate change issues—told local reporters that he has heard interest from solar energy fans in St. Petersburg and Orlando who may advocate for solar ordinances in their cities as well. Earthjustice now has a new office in Miami and we’ll be continuing our fight to make the Sunshine State live up to its name, moving away from dirty fossil fuels and towards renewable energy. Stay tuned. Based in Miami, Tania is the managing attorney of the Florida regional office. She holds a strong commitment to social justice issues and public interest law. Over the course of her legal career, Tania has handled cases related to occupational exposure from pesticides, worked to advance and protect the rights of immigrants, and worked on juvenile justice and educational reform.